This article is about drug abuse. For the Dice album, see Drug Abuse (album). Substance abuse, also known as drug abuse, is a patterned use of a drug in which the user consumes the substance in amounts or with methods which are harmful to themselves or others, and is a form of substance-related disorder. Widely differing definitions of drug abuse are used in public health, medical and criminal justice contexts. In some cases criminal or anti-social behaviour occurs when the person is under the influence of a drug, and long term personality changes in individuals may occur as well. In addition to possible physical, social, and psychological harm, use of some drugs may also lead to criminal penalties, although these vary widely depending on the local jurisdiction. Drugs most often associated with this term include: alcohol, cannabis, barbiturates, benzodiazepines, cocaine, methaqualone, opioids and some substituted amphetamines like methamphetamine and MDMA. The exact cause of substance abuse is not clear, with the two predominant theories being: either a genetic disposition which is learned from others, or a habit which if addiction develops, manifests itself as a chronic debilitating disease. In 2010 about 5% of people (230 million) used an illicit substance. Of these 27 million have high-risk drug use otherwise known as recurrent drug use causing harm to their health, psychological problems, or social problems that put them at risk of those dangers. In 2015 substance use disorders resulted in 307,400 deaths, up from 165,000 deaths in 1990. Of these, the highest numbers are from alcohol use disorders at 137,500, opioid use disorders at 122,100 deaths, amphetamine use disorders at 12,200 deaths, and cocaine use disorders at 11,100. Public health practitioners have attempted to look at substance use from a broader perspective than the individual, emphasizing the role of society, culture, and availability. Some health professionals choose to avoid the terms alcohol or drug "abuse" in favor of language they consider more objective, such as "substance and alcohol type problems" or "harmful/problematic use" of drugs. The Health Officers Council of British Columbia — in their 2005 policy discussion paper, A Public Health Approach to Drug Control in Canada — has adopted a public health model of psychoactive substance use that challenges the simplistic black-and-white construction of the binary (or complementary) antonyms "use" vs. "abuse". This model explicitly recognizes a spectrum of use, ranging from beneficial use to chronic dependence. A 2010 study ranking various illegal and legal drugs based on statements by drug-harm experts. Alcohol was found to be the overall most dangerous drug. 'Drug abuse' is no longer a current medical diagnosis in either of the most used diagnostic tools in the world, the American Psychiatric Association's Diagnostic and Statistical Manual of Mental Disorders (DSM), and the World Health Organization's International Statistical Classification of Diseases (ICD). This diagram depicts the correlations among the usage of 18 legal and illegal drugs: alcohol, amphetamines, amyl nitrite, benzodiazepine, cannabis, chocolate, cocaine, caffeine, crack, ecstasy, heroin, ketamine, legal highs, LSD, methadone, magic mushrooms (MMushrooms), nicotine and volatile substance abuse (VSA). Usage is defined as having used the drug at least once during years 2005–2015. 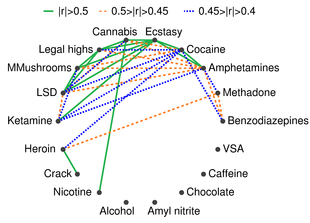 The colored links between drugs indicate the correlations with |r|>0.4, where |r| is the absolute value of the Pearson correlation coefficient. Philip Jenkins suggests that there are two issues with the term "drug abuse". First, what constitutes a "drug" is debatable. For instance, GHB, a naturally occurring substance in the central nervous system is considered a drug, and is illegal in many countries, while nicotine is not officially considered a drug in most countries. Drug misuse is a term used commonly when prescription medication with sedative, anxiolytic, analgesic, or stimulant properties are used for mood alteration or intoxication ignoring the fact that overdose of such medicines can sometimes have serious adverse effects. It sometimes involves drug diversion from the individual for whom it was prescribed. Prescription misuse has been defined differently and rather inconsistently based on status of drug prescription, the uses without a prescription, intentional use to achieve intoxicating effects, route of administration, co-ingestion with alcohol, and the presence or absence of dependence symptoms. Chronic use of certain substances leads to a change in the central nervous system known as a 'tolerance' to the medicine such that more of the substance is needed in order to produce desired effects. With some substances, stopping or reducing use can cause withdrawal symptoms to occur, but this is highly dependent on the specific substance in question. The rate of prescription drug use is fast overtaking illegal drug use in the United States. According to the National Institute of Drug Abuse, 7 million people were taking prescription drugs for nonmedical use in 2010. Among 12th graders, nonmedical prescription drug use is now second only to cannabis. In 2011, "Nearly 1 in 12 high school seniors reported nonmedical use of Vicodin; 1 in 20 reported such use of OxyContin." Both of these drugs contain opioids. A 2017 survey of 12th graders in the United States, found misuse of oxycontin of 2.7 percent, compared to 5.5 percent at its peak in 2005. Misuse of the combination hydrocodone/paracetamol was at its lowest since a peak of 10.5 percent in 2003. This decrease may be related to public health initiatives and decreased availability. Avenues of obtaining prescription drugs for misuse are varied: sharing between family and friends, illegally buying medications at school or work, and often "doctor shopping" to find multiple physicians to prescribe the same medication, without knowledge of other prescribers. Increasingly, law enforcement is holding physicians responsible for prescribing controlled substances without fully establishing patient controls, such as a patient "drug contract". Concerned physicians are educating themselves on how to identify medication-seeking behavior in their patients, and are becoming familiar with "red flags" that would alert them to potential prescription drug abuse. 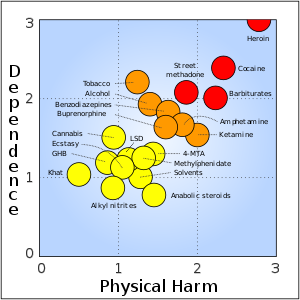 The Physical harm, Dependence liability, and Social harm scores were each computed from the average of three distinct ratings. The highest possible harm rating for each rating scale is 3.0. Physical harm is the average rating of the scores for acute binge use, chronic use, and intravenous use. Dependence liability is the average rating of the scores for intensity of pleasure, psychological dependence, and physical dependence. Social harm is the average rating of the scores for drug intoxication, health-care costs, and other social harms. Total harm was computed as the average of the Physical harm, Dependence liability, and Social harm scores. There is a high rate of suicide in alcoholics and other drug abusers. The reasons believed to cause the increased risk of suicide include the long-term abuse of alcohol and other drugs causing physiological distortion of brain chemistry as well as the social isolation. Another factor is the acute intoxicating effects of the drugs may make suicide more likely to occur. Suicide is also very common in adolescent alcohol abusers, with 1 in 4 suicides in adolescents being related to alcohol abuse. In the US, approximately 30% of suicides are related to alcohol abuse. Alcohol abuse is also associated with increased risks of committing criminal offences including child abuse, domestic violence, rapes, burglaries and assaults. Drug abuse, including alcohol and prescription drugs, can induce symptomatology which resembles mental illness. This can occur both in the intoxicated state and also during the withdrawal state. In some cases these substance induced psychiatric disorders can persist long after detoxification, such as prolonged psychosis or depression after amphetamine or cocaine abuse. A protracted withdrawal syndrome can also occur with symptoms persisting for months after cessation of use. Benzodiazepines are the most notable drug for inducing prolonged withdrawal effects with symptoms sometimes persisting for years after cessation of use. Both alcohol, barbiturate as well as benzodiazepine withdrawal can potentially be fatal. Abuse of hallucinogens can trigger delusional and other psychotic phenomena long after cessation of use. Cannabis may trigger panic attacks during intoxication and with continued use, it may cause a state similar to dysthymia. Researchers have found that daily cannabis use and the use of high-potency cannabis are independently associated with a higher chance of developing schizophrenia and other psychotic disorders. Severe anxiety and depression are commonly induced by sustained alcohol abuse, which in most cases abates with prolonged abstinence. Even sustained moderate alcohol use may increase anxiety and depression levels in some individuals. In most cases these drug induced psychiatric disorders fade away with prolonged abstinence. Impulsivity is characterized by actions based on sudden desires, whims, or inclinations rather than careful thought. Individuals with substance abuse have higher levels of impulsivity, and individuals who use multiple drugs tend to be more impulsive. A number of studies using the Iowa gambling task as a measure for impulsive behavior found that drug using populations made more risky choices compared to healthy controls. There is a hypothesis that the loss of impulse control may be due to impaired inhibitory control resulting from drug induced changes that take place in the frontal cortex. The neurodevelopmental and hormonal changes that happen during adolescence may modulate impulse control that could possibly lead to the experimentation with drugs and may lead to the road of addiction. Impulsivity is thought to be a facet trait in the neuroticism personality domain (overindulgence/negative urgency) which is prospectively associated with the development of substance abuse. There are several different screening tools that have been validated for use with adolescents such as the CRAFFT Screening Test and in adults the CAGE questionnaire. Some recommendations for screening tools for substance misuse in pregnancy include that they take less than 10 minutes, should be used routinely, include an educational component. Tools suitable for pregnant women include i.a. 4Ps, T-ACE, TWEAK, TQDH (Ten-Question Drinking History), and AUDIT. From the applied behavior analysis literature, behavioral psychology, and from randomized clinical trials, several evidenced based interventions have emerged: behavioral marital therapy, motivational Interviewing, community reinforcement approach, exposure therapy, contingency management They help suppress cravings and mental anxiety, improve focus on treatment and new learning behavioral skills, ease withdrawal symptoms and reduce the chances of relapse. In children and adolescents, cognitive behavioral therapy (CBT) and family therapy currently has the most research evidence for the treatment of substance abuse problems. Well-established studies also include ecological family-based treatment and group CBT. These treatments can be administered in a variety of different formats, each of which has varying levels of research support Research has shown that what makes group CBT most effective is that it promotes the development of social skills, developmentally appropriate emotional regulatory skills and other interpersonal skills. A few integrated treatment models, which combines parts from various types of treatment, have also been seen as both well-established or probably effective. A study on maternal alcohol and drug use has shown that integrated treatment programs have produced significant results, resulting in higher negative results on toxicology screens. Additionally, brief school-based interventions have been found to be effective in reducing adolescent alcohol and cannabis use and abuse. Motivational interviewing can also be effective in treating substance use disorder in adolescents. Alcoholics Anonymous and Narcotics Anonymous are one of the most widely known self-help organizations in which members support each other not to use alcohol. Social skills are significantly impaired in people suffering from alcoholism due to the neurotoxic effects of alcohol on the brain, especially the prefrontal cortex area of the brain. It has been suggested that social skills training adjunctive to inpatient treatment of alcohol dependence is probably efficacious, including managing the social environment. A number of medications have been approved for the treatment of substance abuse. These include replacement therapies such as buprenorphine and methadone as well as antagonist medications like disulfiram and naltrexone in either short acting, or the newer long acting form. Several other medications, often ones originally used in other contexts, have also been shown to be effective including bupropion and modafinil. Methadone and buprenorphine are sometimes used to treat opiate addiction. These drugs are used as substitutes for other opioids and still cause withdrawal symptoms. Antipsychotic medications have not been found to be useful. Acamprostate is a glutamatergic NMDA antagonist, which helps with alcohol withdrawal symptoms because alcohol withdrawal is associated with a hyperglutamatergic system. Individuals who have a comorbid psychological disorder often have a poor prognosis if either disorder is untreated. Historically most individuals with dual diagnosis either received treatment only for one of their disorders or they didn’t receive any treatment all. However, since the 1980s, there has been a push towards integrating mental health and addiction treatment. In this method, neither condition is considered primary and both are treated simultaneously by the same provider. Disability-adjusted life year for drug use disorders per 100,000 inhabitants in 2004. The initiation of drug and alcohol use is most likely to occur during adolescence, and some experimentation with substances by older adolescents is common. For example, results from 2010 Monitoring the Future survey, a nationwide study on rates of substance use in the United States, show that 48.2% of 12th graders report having used an illicit drug at some point in their lives. In the 30 days prior to the survey, 41.2% of 12th graders had consumed alcohol and 19.2% of 12th graders had smoked tobacco cigarettes. In 2009 in the United States about 21% of high school students have taken prescription drugs without a prescription. And earlier in 2002, the World Health Organization estimated that around 140 million people were alcohol dependent and another 400 million with alcohol-related problems. Studies have shown that the large majority of adolescents will phase out of drug use before it becomes problematic. Thus, although rates of overall use are high, the percentage of adolescents who meet criteria for substance abuse is significantly lower (close to 5%). According to BBC, "Worldwide, the UN estimates there are more than 50 million regular users of morphine diacetate (heroin), cocaine and synthetic drugs." More than 72,000 Americans died from drug overdoses in 2017. Among these, the sharpest increase occurred among deaths related to fentanyl and synthetic opioids (> 29,000 deaths). See charts below. 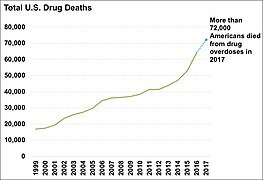 Total yearly U.S. drug deaths. US yearly overdose deaths, and the drugs involved. …as a general rule, we reserve the term drug abuse to apply to the illegal, nonmedical use of a limited number of substances, most of them drugs, which have properties of altering the mental state in ways that are considered by social norms and defined by statute to be inappropriate, undesirable, harmful, threatening, or, at minimum, culture-alien. …'use' refers to the proper place of stimulants in medical practice; 'misuse' applies to the physician's role in initiating a potentially dangerous course of therapy; and 'abuse' refers to self-administration of these drugs without medical supervision and particularly in large doses that may lead to psychological dependency, tolerance and abnormal behavior. ...drug abuse may refer to any type of drug or chemical without regard to its pharmacologic actions. It is an eclectic concept having only one uniform connotation: societal disapproval. ... The Commission believes that the term drug abuse must be deleted from official pronouncements and public policy dialogue. The term has no functional utility and has become no more than an arbitrary codeword for that drug use which is presently considered wrong. The first edition of the American Psychiatric Association's Diagnostic and Statistical Manual of Mental Disorders (published in 1952) grouped alcohol and drug abuse under Sociopathic Personality Disturbances, which were thought to be symptoms of deeper psychological disorders or moral weakness. The third edition, published in 1980, was the first to recognize substance abuse (including drug abuse) and substance dependence as conditions separate from substance abuse alone, bringing in social and cultural factors. The definition of dependence emphasised tolerance to drugs, and withdrawal from them as key components to diagnosis, whereas abuse was defined as "problematic use with social or occupational impairment" but without withdrawal or tolerance. The fifth edition of the DSM (DSM-5), was released in 2013, and it revisited this terminology. The principal change was a transition from the abuse/dependence terminology. In the DSM-IV era, abuse was seen as an early form or less hazardous form of the disease characterized with the dependence criteria. However, the APA's 'dependence' term, as noted above, does not mean that physiologic dependence is present but rather means that a disease state is present, one that most would likely refer to as an addicted state. Many involved recognize that the terminology has often led to confusion, both within the medical community and with the general public. The American Psychiatric Association requested input as to how the terminology of this illness should be altered as it moves forward with DSM-5 discussion. In the DSM-5, substance abuse and substance dependence have been merged into the category of substance use disorders and they now longer exist as individual concepts. While substance abuse and dependence were either present or not, substance use disorder has three levels of severity: mild, moderate and severe. Most governments have designed legislation to criminalize certain types of drug use. These drugs are often called "illegal drugs" but generally what is illegal is their unlicensed production, distribution, and possession. These drugs are also called "controlled substances". Even for simple possession, legal punishment can be quite severe (including the death penalty in some countries). Laws vary across countries, and even within them, and have fluctuated widely throughout history. Attempts by government-sponsored drug control policy to interdict drug supply and eliminate drug abuse have been largely unsuccessful. In spite of the huge efforts by the U.S., drug supply and purity has reached an all-time high, with the vast majority of resources spent on interdiction and law enforcement instead of public health. In the United States, the number of nonviolent drug offenders in prison exceeds by 100,000 the total incarcerated population in the EU, despite the fact that the EU has 100 million more citizens. Despite drug legislation (or perhaps because of it), large, organized criminal drug cartels operate worldwide. Advocates of decriminalization argue that drug prohibition makes drug dealing a lucrative business, leading to much of the associated criminal activity. Policymakers try to understand the relative costs of drug-related interventions. An appropriate drug policy relies on the assessment of drug-related public expenditure based on a classification system where costs are properly identified. Labelled drug-related expenditures are defined as the direct planned spending that reflects the voluntary engagement of the state in the field of illicit drugs. Direct public expenditures explicitly labeled as drug-related can be easily traced back by exhaustively reviewing official accountancy documents such as national budgets and year-end reports. Unlabelled expenditure refers to unplanned spending and is estimated through modeling techniques, based on a top-down budgetary procedure. Starting from overall aggregated expenditures, this procedure estimates the proportion causally attributable to substance abuse (Unlabelled Drug-related Expenditure = Overall Expenditure × Attributable Proportion). For example, to estimate the prison drug-related expenditures in a given country, two elements would be necessary: the overall prison expenditures in the country for a given period, and the attributable proportion of inmates due to drug-related issues. The product of the two will give a rough estimate that can be compared across different countries. As part of the reporting exercise corresponding to 2005, the European Monitoring Centre for Drugs and Drug Addiction's network of national focal points set up in the 27 European Union (EU) Member States, Norway, and the candidates countries to the EU, were requested to identify labeled drug-related public expenditure, at the country level. This was reported by 10 countries categorized according to the functions of government, amounting to a total of EUR 2.17 billion. Overall, the highest proportion of this total came within the government functions of Health (66%) (e.g. medical services), and Public Order and Safety (POS) (20%) (e.g. police services, law courts, prisons). By country, the average share of GDP was 0.023% for Health, and 0.013% for POS. However, these shares varied considerably across countries, ranging from 0.00033% in Slovakia, up to 0.053% of GDP in Ireland in the case of Health, and from 0.003% in Portugal, to 0.02% in the UK, in the case of POS; almost a 161-fold difference between the highest and the lowest countries for Health, and a 6-fold difference for POS. Why do Ireland and the UK spend so much in Health and POS, or Slovakia and Portugal so little, in GDP terms? To respond to this question and to make a comprehensive assessment of drug-related public expenditure across countries, this study compared Health and POS spending and GDP in the 10 reporting countries. Results found suggest GDP to be a major determinant of the Health and POS drug-related public expenditures of a country. 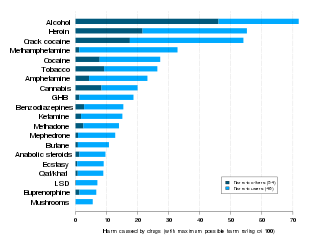 Labelled drug-related public expenditure showed a positive association with the GDP across the countries considered: r = 0.81 in the case of Health, and r = 0.91 for POS. The percentage change in Health and POS expenditures due to a one percent increase in GDP (the income elasticity of demand) was estimated to be 1.78% and 1.23% respectively. Being highly income elastic, Health and POS expenditures can be considered luxury goods; as a nation becomes wealthier it openly spends proportionately more on drug-related health and public order and safety interventions. The UK Home Office estimated that the social and economic cost of drug abuse to the UK economy in terms of crime, absenteeism and sickness is in excess of £20 billion a year. However, the UK Home Office does not estimate what portion of those crimes are unintended consequences of drug prohibition (crimes to sustain expensive drug consumption, risky production and dangerous distribution), nor what is the cost of enforcement. Those aspects are necessary for a full analysis of the economics of prohibition. These figures represent overall economic costs, which can be divided in three major components: health costs, productivity losses and non-health direct expenditures. Health-related costs were projected to total $16 billion in 2002. Productivity losses were estimated at $128.6 billion. In contrast to the other costs of drug abuse (which involve direct expenditures for goods and services), this value reflects a loss of potential resources: work in the labor market and in household production that was never performed, but could reasonably be expected to have been performed absent the impact of drug abuse. Included are estimated productivity losses due to premature death ($24.6 billion), drug abuse-related illness ($33.4 billion), incarceration ($39.0 billion), crime careers ($27.6 billion) and productivity losses of victims of crime ($1.8 billion). The non-health direct expenditures primarily concern costs associated with the criminal justice system and crime victim costs, but also include a modest level of expenses for administration of the social welfare system. The total for 2002 was estimated at $36.4 billion. The largest detailed component of these costs is for state and federal corrections at $14.2 billion, which is primarily for the operation of prisons. Another $9.8 billion was spent on state and local police protection, followed by $6.2 billion for federal supply reduction initiatives. According to a report from the Agency for Healthcare Research and Quality (AHRQ), Medicaid was billed for a significantly higher number of hospitals stays for Opioid drug overuse than Medicare or private insurance in 1993. By 2012, the differences were diminished. Over the same time, Medicare had the most rapid growth in number of hospital stays. Immigrant and refugees have often been under great stress, physical trauma and depression and anxiety due to separation from loved ones often characterize the pre-migration and transit phases, followed by "cultural dissonance," language barriers, racism, discrimination, economic adversity, overcrowding, social isolation, and loss of status and difficulty obtaining work and fears of deportation are common. Refugees frequently experience concerns about the health and safety of loved ones left behind and uncertainty regarding the possibility of returning to their country of origin. For some, substance abuse functions as a coping mechanism to attempt to deal with these stressors. Immigrants and refugees may bring the substance use and abuse patterns and behaviors of their country of origin, or adopt the attitudes, behaviors, and norms regarding substance use and abuse that exist within the dominant culture into which they are entering. Street children in many developing countries are a high risk group for substance misuse, in particular solvent abuse. Drawing on research in Kenya, Cottrell-Boyce argues that "drug use amongst street children is primarily functional – dulling the senses against the hardships of life on the street – but can also provide a link to the support structure of the ‘street family’ peer group as a potent symbol of shared experience." In order to maintain high-quality performance, some musicians take chemical substances. Some musicians take drugs or alcohol to deal with the stress of performing. As a group they have a higher rate of substance abuse. The most common chemical substance which is abused by pop musicians is cocaine, because of its neurological effects. Stimulants like cocaine increase alertness and cause feelings of euphoria, and can therefore make the performer feel as though they in some ways ‘own the stage’. One way in which substance abuse is harmful for a performer (musicians especially) is if the substance being abused is aspirated. The lungs are an important organ used by singers, and addiction to cigarettes may seriously harm the quality of their performance. Smoking causes harm to alveoli, which are responsible for absorbing oxygen. Substance abuse can be another contributing factor that affects physical and mental health of veterans. Substance abuse may also damage personal relationships families and lead to financial difficulty. There is evidence to suggest that substance abuse disproportionately affects the homeless veteran population. A 2015 Florida study compared causes of homelessness between veterans and non veteran populations in a self reporting questionnaire. The results from the study found that 17.8% of the homeless veteran participants attributed their homelessness to alcohol and drug related problems compared to just 3.7% of the non-veteran homeless group. A 2003 study found that homelessness was associated with access to support from family/friends and services. However, this relationship was not true when comparing homeless participants who had a current substance-use disorders. The U.S. Department of Veterans Affairs provide a summary of treatment options for veterans with substance use disorder. For treatments that do not involve medication, they offer a therapeutic options that focused on finding outside support groups and “looking at how substance use problems may relate to other problems such as PTSD and depression”. ^ a b c d e f g Nutt, D.; King, L. A.; Saulsbury, W.; Blakemore, C. (2007). "Development of a rational scale to assess the harm of drugs of potential misuse". The Lancet. 369 (9566): 1047–1053. doi:10.1016/S0140-6736(07)60464-4. PMID 17382831. ^ a b c "World Drug Report 2012" (PDF). UNITED NATIONS. Retrieved 27 September 2016. ^ a b "EMCDDA | Information on the high-risk drug use (HRDU) (formerly 'problem drug use' (PDU)) key indicator". www.emcdda.europa.eu. Retrieved 2016-09-27. ^ "Addiction is a Chronic Disease". Archived from the original on 24 June 2014. Retrieved 2 July 2014. ^ "A Public Health Approach" (PDF). Retrieved 1 April 2017. ^ Nutt, David J; King, Leslie A; Phillips, Lawrence D (November 2010). "Drug harms in the UK: a multicriteria decision analysis". The Lancet. 376 (9752): 1558–1565. CiteSeerX 10.1.1.690.1283. doi:10.1016/S0140-6736(10)61462-6. PMID 21036393. ^ Barrett SP, Meisner JR, Stewart SH (November 2008). "What constitutes prescription drug misuse? Problems and pitfalls of current conceptualizations" (PDF). Curr Drug Abuse Rev. 1 (3): 255–62. doi:10.2174/1874473710801030255. PMID 19630724. Archived from the original (PDF) on 2010-06-15. ^ "The Prescription Drug Abuse Epidemic". PDMP Center of Excellence. 2010–2013. ^ "Topics in Brief: Prescription Drug Abuse" NIDA, December 2011. ^ a b c "Vaping popular among teens; opioid misuse at historic lows". National Institute on Drug Abuse. 14 December 2017. Retrieved 10 April 2019. ^ "Combating Prescription Drug Abuse in Your Practice" Archived 2012-06-18 at the Wayback Machine Aubrey Westgate, Physicians Practice, June 2012. ^ Burke PJ, O'Sullivan J, Vaughan BL (November 2005). "Adolescent substance use: brief interventions by emergency care providers". Pediatr Emerg Care. 21 (11): 770–6. doi:10.1097/01.pec.0000186435.66838.b3. PMID 16280955. ^ O'Connor, Rory; Sheehy, Noel (29 January 2000). Understanding suicidal behaviour. Leicester: BPS Books. pp. 33–36. ISBN 978-1-85433-290-5. ^ Isralowitz, Richard (2004). Drug use: a reference handbook. Santa Barbara, Calif.: ABC-CLIO. pp. 122–123. ISBN 978-1-57607-708-5. ^ Di Forti M, Marconi A, Carra E, Fraietta S, Trotta A, Bonomo M, Bianconi F, Gardner-Sood P, O'Connor J, Russo M, Stilo SA, Marques TR, Mondelli V, Dazzan P, Pariante C, David AS, Gaughran F, Atakan Z, Iyegbe C, Powell J, Morgan C, Lynskey M, Murray RM (2015). "Proportion of patients in south London with first-episode psychosis attributable to use of high potency cannabis: a case-control study" (PDF). Lancet Psychiatry. 2 (3): 233–8. doi:10.1016/S2215-0366(14)00117-5. PMID 26359901. ^ Marta Di Forti (17 December 2013). "Daily Use, Especially of High-Potency Cannabis, Drives the Earlier Onset of Psychosis in Cannabis Users". Schizophrenia Bulletin. 40 (6): 1509–1517. doi:10.1093/schbul/sbt181. PMC 4193693. PMID 24345517. ^ "Impulsivity". The Free Dictionary. ^ Bishara AJ, Pleskac TJ, Fridberg DJ, Yechiam E, Lucas J, Busemeyer JR, Finn PR, Stout JC (2009). "Similar Processes Despite Divergent Behavior in Two Commonly Used Measures of Risky Decision Making". J Behav Decis Mak. 22 (4): 435–454. doi:10.1002/bdm.641. PMC 3152830. PMID 21836771. ^ Chambers RA, Taylor JR, Potenza MN (2003). "Developmental neurocircuitry of motivation in adolescence: a critical period of addiction vulnerability". Am J Psychiatry. 160 (6): 1041–52. doi:10.1176/appi.ajp.160.6.1041. PMC 2919168. PMID 12777258. ^ Morse, Barbara (1997). Screening for Substance Abuse During Pregnancy: Improving Care, Improving Health (PDF). pp. 4–5. ISBN 978-1-57285-042-2. ^ O'Donohue, W; K.E. Ferguson (2006). "Evidence-Based Practice in Psychology and Behavior Analysis". The Behavior Analyst Today. 7 (3): 335–350. doi:10.1037/h0100155. Retrieved 2008-03-24. ^ Chambless, D.L. ; et al. (1998). "An update on empirically validated therapies" (PDF). Clinical Psychology. 49: 5–14. Retrieved 2008-03-24. ^ "NIH Senior Health "Build With You in Mind": Survey". nihseniorhealth.gov. Archived from the original on 2015-08-11. Retrieved 29 July 2015. ^ "Association for Behavioral and Cognitive Therapies – What is CBT?". Archived from the original on 2010-04-21. ^ "Association for Behavioral and Cognitive Therapies – What is Family Therapy?". Archived from the original on 2010-06-13. ^ a b Hogue, A; Henderson, CE; Ozechowski, TJ; Robbins, MS (2014). "Evidence base on outpatient behavioral treatments for adolescent substance use: updates and recommendations 2007–2013". Journal of Clinical Child and Adolescent Psychology. 43 (5): 695–720. doi:10.1080/15374416.2014.915550. PMID 24926870. ^ "Association for Behavioral and Cognitive Therapies – Treatment for Substance Use Disorders". Archived from the original on 2010-04-21. ^ Engle, Bretton; Macgowan, Mark J. (2009-08-05). "A Critical Review of Adolescent Substance Abuse Group Treatments". Journal of Evidence-Based Social Work. 6 (3): 217–243. doi:10.1080/15433710802686971. ISSN 1543-3714. PMID 20183675. ^ a b "Maternal substance use and integrated treatment programs for women with substance abuse issues and their children: a meta-analysis". www.crd.york.ac.uk. Retrieved 2016-03-09. ^ Carney, Tara; Myers, Bronwyn J; Louw, Johann; Okwundu, Charles I (2016-01-20). "Brief school-based interventions and behavioural outcomes for substance-using adolescents". Cochrane Database of Systematic Reviews (1): CD008969. doi:10.1002/14651858.cd008969.pub3. PMID 26787125. ^ Jensen, Chad D.; Cushing, Christopher C.; Aylward, Brandon S.; Craig, James T.; Sorell, Danielle M.; Steele, Ric G. (2011). "Effectiveness of motivational interviewing interventions for adolescent substance use behavior change: A meta-analytic review". Journal of Consulting and Clinical Psychology. 79 (4): 433–440. doi:10.1037/a0023992. PMID 21728400. ^ Barnett, Elizabeth; Sussman, Steve; Smith, Caitlin; Rohrbach, Louise A.; Spruijt-Metz, Donna (2012). "Motivational Interviewing for adolescent substance use: A review of the literature". Addictive Behaviors. 37 (12): 1325–1334. doi:10.1016/j.addbeh.2012.07.001. PMC 3496394. PMID 22958865. ^ "Self-Help Groups Article". Retrieved May 27, 2015. ^ Purvis G.; MacInnis D. M. (2009). "Implementation of the Community Reinforcement Approach (CRA) in a Long-Standing Addictions Outpatient Clinic" (PDF). Journal of Behavior Analysis of Sports, Health, Fitness and Behavioral Medicine. 2: 133–44. Archived from the original (PDF) on 2010-12-29. ^ "Current Pharmacological Treatment Available for Alchhol Abuse". The California Evidence-Based Clearinghouse. 2006–2013. ^ Maglione, M; Maher, AR; Hu, J; Wang, Z; Shanman, R; Shekelle, PG; Roth, B; Hilton, L; Suttorp, MJ; Ewing, BA; Motala, A; Perry, T (September 2011). "Off-Label Use of Atypical Antipsychotics: An Update [Internet]". Agency for Healthcare Research and Quality (US). PMID 22132426. Report No. : 11-EHC087-EF. ^ Lingford-Hughes AR, Welch S, Peters L, Nutt DJ, British Association for Psychopharmacology, Expert Reviewers Group (2012-07-01). "BAP updated guidelines: evidence-based guidelines for the pharmacological management of substance abuse, harmful use, addiction and comorbidity: recommendations from BAP". Journal of Psychopharmacology. 26 (7): 899–952. doi:10.1177/0269881112444324. ISSN 0269-8811. PMID 22628390. ^ a b Lingford-Hughes A. R.; Welch S.; Peters L.; Nutt D. J. (2012). "BAP updated guidelines: evidence-based guidelines for the pharmacological management of substance abuse, harmful use, addiction and comorbidity: recommendations from BAP" (PDF). Journal of Psychopharmacology. 26 (7): 899–952. doi:10.1177/0269881112444324. PMID 22628390. Archived from the original (PDF) on 2012-12-03. ^ a b Peterson Ashley L (2013). "Integrating Mental Health and Addictions Services to Improve Client Outcomes". Issues in Mental Health Nursing. 34 (10): 752–756. doi:10.3109/01612840.2013.809830. PMID 24066651. ^ a b Johnston, L. D., O’Malley, P. M., Bachman, J. G., & Schulenberg, J. E. (2011). Monitoring the Future national results on adolescent drug use: Overview of key findings, 2010. Ann Arbor: Institute for Social Research, The University of Michigan. ^ "CDC Newsroom Press Release June 3, 2010". ^ Glasscote, R.M., Sussex, J.N., Jaffe, J.H., Ball, J., Brill, L. (1932). The Treatment of Drug Abuse for people like you...: Programs, Problems, Prospects. Washington, D.C.: Joint Information Service of the American Psychiatric Association and the National Association for Mental Health. ^ American Psychiatric Association (1994). Diagnostic and statistical manual of mental disorders (4th edition). Washington, DC. ^ Hasin, Deborah S.; O’Brien, Charles P.; Auriacombe, Marc; Borges, Guilherme; Bucholz, Kathleen; Budney, Alan; Compton, Wilson M.; Crowley, Thomas; Ling, Walter (2013-08-01). "DSM-5 Criteria for Substance Use Disorders: Recommendations and Rationale". American Journal of Psychiatry. 170 (8): 834–851. doi:10.1176/appi.ajp.2013.12060782. ISSN 0002-953X. PMC 3767415. PMID 23903334. ^ "Diagnostic and Statistical Manual of Mental Disorders: DSM-5 (5th edition)2014 102 Washington, DC American Psychiatric Association 2013 xliv+947 pp. 9780890425541(hbck);9780890425558(pbck) £175 $199 (hbck); £45 $69 (pbck)". Reference Reviews. 28 (3): 36–37. 11 March 2014. doi:10.1108/rr-10-2013-0256. ^ Copeman M (April 2003). "Drug supply and drug abuse". CMAJ. 168 (9): 1113, author reply 1113. PMC 153673. PMID 12719309. Archived from the original on 2009-09-06. ^ Wood E, Tyndall MW, Spittal PM, et al. (January 2003). "Impact of supply-side policies for control of illicit drugs in the face of the AIDS and overdose epidemics: investigation of a massive heroin seizure". CMAJ. 168 (2): 165–9. PMC 140425. PMID 12538544. ^ Bewley-Taylor, Dave, Hallam, Chris, Allen Rob. The Beckley Foundation Drug Policy Programme: The Incarceration of Drug Offenders: An Overview. March 2009. ^ a b c Prieto L (2010). "Labelled drug-related public expenditure in relation to gross domestic product (gdp) in Europe: A luxury good?". Substance Abuse Treatment, Prevention, and Policy. 5: 9. doi:10.1186/1747-597x-5-9. PMC 2881082. PMID 20478069. ^ "NHS and Drug Abuse". National Health Service (NHS). March 22, 2010. Retrieved March 22, 2010. ^ "Home Office | Tackling Drugs Changing Lives | Drugs in the workplace". 2007-06-09. Archived from the original on 2007-06-09. Retrieved 2016-09-19. ^ Thornton, Mark. "The Economics of Prohibition". ^ Drachman, D. (1992). "A stage-of-migration framework for service to immigrant populations". Social Work. 37 (1): 68–72. doi:10.1093/sw/37.1.68. ^ Pumariega A. J.; Rothe E.; Pumariega J. B. (2005). "Mental health of immigrants and refugees". Community Mental Health Journal. 41 (5): 581–597. CiteSeerX 10.1.1.468.6034. doi:10.1007/s10597-005-6363-1. PMID 16142540. ^ a b c d National Institute on Alcohol Abuse and Alcoholism. (2005). Module 10F: Immigrants, refugees, and alcohol. In NIAAA: Social work education for the prevention and treatment of alcohol use disorders (NIH publication). Washington, D.C.
^ Caetano R.; Clark C. L.; Tam T. (1998). "Alcohol consumption among racial/ethnic minorities: Theory and research". Journal of Alcohol, Health, and Research. 22 (4): 233–241. ^ UNODC. "Understanding Substance Use Among Street Children" (PDF). Retrieved 30 January 2014. ^ Cottrell-Boyce, Joe (2010). "THE ROLE OF SOLVENTS IN THE LIVES OF STREET CHILDREN" (PDF). African Journal of Drug & Alcohol Studies. 9 (2): 93–102. doi:10.4314/ajdas.v9i2.64142. Retrieved 28 January 2014. ^ a b c d Breitenfeld D.; Thaller V.; Perić B.; Jagetic N.; Hadžić D.; Breitenfeld T. (2008). "Substance abuse in performing musicians". Alcoholism: Journal on Alcoholism and Related Addictions. 44 (1): 37–42. ^ "Treatment Programs for Substance Use Problems – Mental Health". www.mentalhealth.va.gov. Retrieved 2016-12-17. Wikimedia Commons has media related to Substance abuse.